Group II base oils are defined as being more than 90 percent saturates, less than 0.03 percent sulfur and with a viscosity index of 80 to 120. They are often manufactured by hydrocracking, which is a more complex process than what is used for Group I base oils. Since all the hydrocarbon molecules of these oils are saturated, Group II base oils have better antioxidation properties. They also have a clearer color and cost more in comparison to Group I base oils. Still, Group II base oils are becoming very common on the market today and are priced very close to Group I oils. Group III base oils are greater than 90 percent saturates, less than 0.03 percent sulfur and have a viscosity index above 120. These oils are refined even more than Group II base oils and generally are severely hydrocracked (higher pressure and heat). This longer process is designed to achieve a purer base oil. 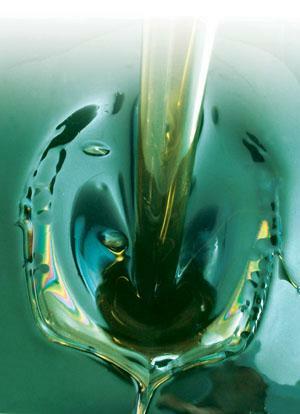 Although made from crude oil, Group III base oils are sometimes described as synthesized hydrocarbons. Like Group II base oils, these oils are also becoming more prevalent. A recent study on the use of base oils in today’s plants in comparison to a little more than a decade ago found a dramatic change has occurred. Present-day Group II base oils are the most commonly used base oils in plants, making up 47 percent of the capacity of plants in which the study was conducted. This compared to 21 percent for both Group II and III base oils just a decade ago. Currently, Group III accounts for less than 1 percent of the capacity in plants. Group I base oils previously made up 56 percent of the capacity, compared to 28 percent of the capacity in today’s plants.